Are You Ready to Receive Financing? Home → Business Funding → Are You Ready to Receive Financing? 1. Have you either beta tested your product or service or done a thorough market survey of your idea? Can you prove that you have a hungry market place and your idea is the right solution? 2. Do you have a viable revenue model along with marketing and sales plan proving that you can capture 2%-5% of a $1 billion market opportunity? In other words, are enough people buying any solution for the problem you’re solving? 3. Can you articulate in-depth industry and competitor knowledge with full understanding of competitor strengths and weaknesses as well as marketplace opportunities and threats? 4. Does your management team have proven industry and management knowledge/experience? 5. Are written, detailed job descriptions included in your plan? Is your team organized and aware of the role they’re playing and their individual goals? 6. Do you have financial forecasts with conservative revenues and aggressive expenses that indicate a viable, profitable business? In other words, if you made limited revenues and had high expenses, would you still show a profit (or could you at least keep the lights on)? 7. Does your financial forecast show adequate cash flow for monthly bank loan repayments or a minimum of three exit strategies with 5x-20x Return on Investment (ROI) for angels and venture capitalists? 8. Does your executive summary motivate angel investors to meet with your team or bank underwriters to read your entire plan? 9. Have you identified the most gifted orator on your management team to be your pitch person? 10. Does your pitch person have a 30-60 second elevator pitch that has investors wanting to set up a meeting with your management team? Total Score – How many questions did you respond “Yes” to? Congratulations! 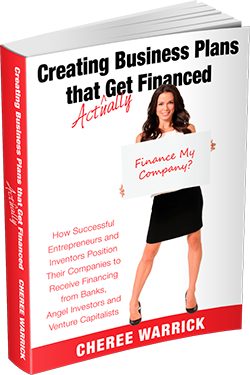 You are ready to begin pursuing financing for your company. Reading through a few chapters of this book and improving areas of weakness will help you achieve your dreams. Many times, you only have one opportunity to make a successful first impression. Whether you are seeking bank financing or angel investment, it’s important to approach these individuals when you are well prepared and confident of presenting information to them in a format that they’ll accept.